Note From Beth: The power of observation is key to learning and perfecting any practice or skill. Observation is not just scanning or browsing, but looking at another organization’s practice with a critical thinking lens and gaining insights. Along with benchmarking – that is comparing your organization’s numbers with an industry average or simply another similar organization or two is great. But if you want to get even deeper insights, do an in-depth review of a similar nonprofit’s practice – whether it be broad – such as digital marketing techniques or narrow such as analyzing specific techniques as part of a content strategy. This is an adaptation of the article “Nine Valuable Marketing Lessons From a Nonprofit – Charitywater.org” written for the KISSmetrics blog by Chloe Gray. charity: water, a nonprofit that brings clean and safe drinking water to people in developing nations, is leading the way when it comes to redefining nonprofit marketing; they are exceptional at inbound marketing, focusing on creating powerful content to inspire people to join their cause. Their marketing has tangible results: in 2012 alone they raised $33 million, and over $8 million of that was raised through their online fundraising platform. While it might not be possible for other nonprofits to perfectly emulate charity: water´s marketing strategy––in fact, it probably wouldn’t be a good idea for them to try given that each nonprofit has a distinct mission, target audience and way of operating––all would benefit from applying even just a few of the lessons we can learn from their incredible marketing. With that in mind, here are nine marketing lessons other nonprofits can take away from charity: water. charity: water has truly mastered the art of getting people to form personal connections with their brand. One of the most powerful ways in which they’ve done this is by building an online platform that allows people to create fundraising campaigns linked to personal events, such as marathons, holidays or birthdays. This is pure genius for enlisting others to spread their message. As each fundraiser shares their campaign with their personal network via word of mouth and online, the number of people who know about charity: water quickly multiplies. At the time of writing this article nearly 180,000 people had collectively raised almost $29 million on charity: water’s online platform. That’s 180,000 people telling their friends, family and whoever else follows them online about charity: water. Brilliant. How can your organization apply this? Think of creative ways to encourage people to link important personal experiences and events to your nonprofit. You don’t necessarily have to do this with an online fundraising platform: you can start by using social media to encourage people to interact with and be vocal about your cause. If you are interested in online fundraising but don’t have the resources to build a custom platform for donations like charity: water, there are applications that help nonprofits get started with online fundraising quickly, including Salsa and Network for Good. Finally, take heed when Young talks about building relationships with their donors that will hopefully last for years. What can you do to make your donors feel so connected to your cause that they’ll become your brand advocates and stick around for the long haul? 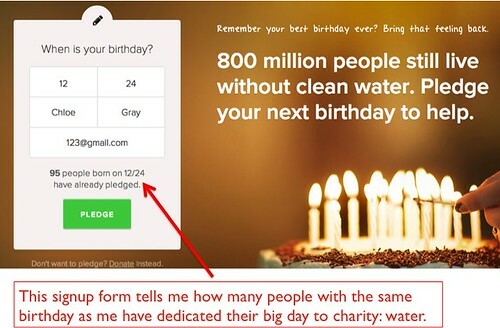 charity: water is excellent at using social proof to encourage people to fundraise on their online platform. They employ numbers throughout their site to make people feel aligned with thousands of others, and they give a face and a voice to those thousands with pictures, videos and written stories. 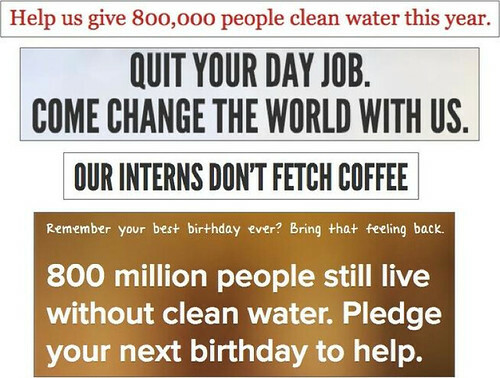 Here are a few images from the charity: water website that show how they employ social proof. Social proof is particularly powerful when famous people are setting the example. 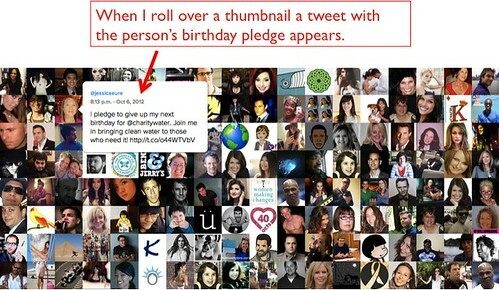 On the “birthdays” section of their website, after discovering that many others with the same birthday as you––and 47,492 people in total at the time of writing––have asked for donations instead of presents for their birthday, charity: water tells you how cool celebrities like Depeche Mode and Tony Hawk pledged their birthdays to the nonprofit. You don’t have to get testimonials from celebrities (although each day it seems that more and more celebrities are publicizing their devotion to social causes); start by collecting short statements from your most loyal donors (both individuals and companies or foundations, if possible) and put them on your website. You can then make each testimonial a piece of content for your social channels by quoting the best parts in an image. Include photos of the donors or the company logo whenever possible. Celebrate your donors in your digital channels in any way you can: create a collage of their photos similar to charity: water’s Twitter thumbnail collage pictured above, or, if you have a blog, highlight the stories of your most devoted donors or volunteers on a monthly basis. Also, if your numbers are impressive, find a way to integrate them into your web copy. charity: water does a great job of including eye-catching numbers throughout their website. Check out this article for a detailed explanation of how to leverage social proof in your marketing efforts (it’s written for companies, but nonprofits can apply many of the tactics mentioned by the author). It’s uncommon for a nonprofit to spend time developing and articulating their unique value proposition, but this is one area in which organizations should act like companies. If you want people to donate to your cause, why not explain what makes your nonprofit stand out from others, just as companies––at least the ones who are good at marketing––often put a lot of energy into explaining to their customers why they’re special (and thus why people should buy from them)? charity: water explains clearly on their homepage the three things that make them different from other nonprofits: their 100% model, their emphasis on proving where donations go with GPS tracking and their collaborations with local partners in the countries to which they bring clean water. A site visitor thinking about donating to charity: water knows immediately what makes them special. In the nonprofit space there is often concern about western organizations traipsing into foreign countries and implementing solutions without really understanding the people’s needs (hence “local partners”). Before deciding on a value proposition, get inside your donors’ heads in order to understand their pain points and what matters most to them. The best way to do this is to talk to them; you can either conduct in-person interviews or, if you already have a significant base of followers, you can send out an online survey. Once you’re confident you’ve nailed a unique value proposition that both sets you apart from nonprofits with a similar cause AND represents what your donors want, make sure to include it on the most important pages of your website. Ideally it will appear in the headline on your homepage, but don’t stop there; follow charity: water´s lead and weave it into other parts of your site, your social media messages, blog posts and your explainer video. charity: water is great at doing this subtly because their value proposition is an integral part of the way the organization operates, and your organization’s should be, too. charity: water’s CEO Scott Harrison is the face of the organization. His personal story of how he went from a “selfish” nightclub and fashion events promoter to volunteering with Mercy Ships and then starting his own nonprofit, which he tells in nearly every speech he gives, is intertwined with the charity: water brand. 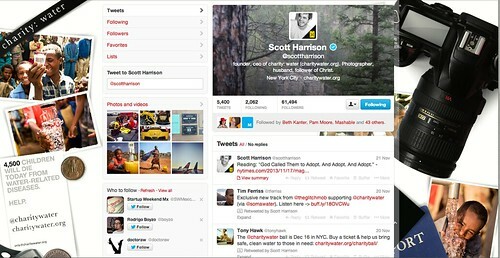 Harrison has over 61.5k followers on Twitter and nearly 10k followers on Instagram. In both social media profiles his publications are mostly about charity: water, including anecdotes about the team, photos from the field and retweets from the official charity: water account. Identify who can be the public face of your organization––if not your founder or director, then someone else who is high-ranking and who will probably be there for a long time. It is important to have employees who embody your organization’s mission statement and know how to communicate it effectively––ideally, they’ll do so not only via the organization’s official channels but also through their personal channels. Adam Braun, the founder of Pencils of Promise, is another example of a founder who is a very effective brand evangelist. With over 310,000 followers, he is a strong voice for the organization on Twitter, and he recently published a memoir that tells the story of how he started his organization. Harrison’s emphasis on telling his personal story when he talks about charity: water sets the tone for the organization’s marketing strategy. After all, the people on the charity: water team are masters at storytelling. They do it on Facebook, Twitter and Instagram as well as on their blog, their website and in their email marketing campaigns. charity: water even has an entire section of their site dedicated to stories from the field, where people who work for or collaborate with the nonprofit tell stories about the experiences they’ve had bringing clean water to people in Rwanda, Uganda, Bangladesh and more. What makes charity: water’s stories so powerful is the use of impactful images and stunning video combined with a very personal, candid style of writing. In fact, Harrison has said that if he talks for an hour, he uses over 200 photos and videos in his presentation. The video from their 2010 September Campaign is a great example of how the nonprofit uses storytelling to communicate its message and inspire donors. 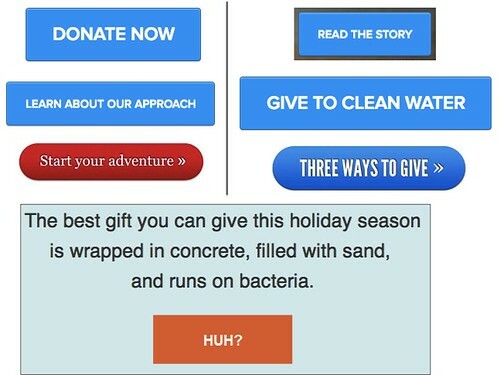 chartiy: water is also excellent at using data to enhance narratives, which they do beautifully on the landing page for their current holiday campaign to bring water to families in Cambodia (hint: roll over each tile for a fun animation). Make storytelling a central part of your marketing efforts. First, identify what story(ies) are central to your mission and message, whether it be how the organization was founded or the way in which your work is changing the world. Then tell these stories in multiple mediums: on your website, on your blog and in your social media channels, for example. 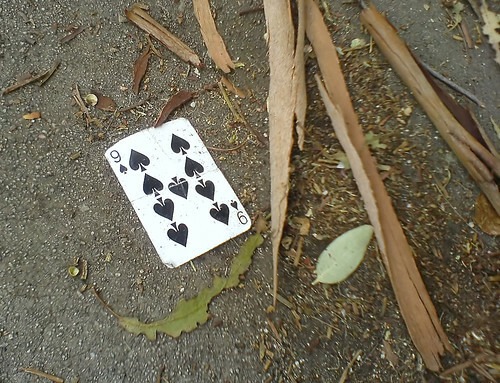 Use photos and video to compliment each narrative as much as possible. Women for Women International is another example of an organization whose founder´s story is very much a part of its brand. Zainab Salbi has talked about growing up in Saddam’s inner circle and how her experiences led her to start Women for Women International. Pencils of Promise is also very good at this. See how Braun tells the organization´s story on its website. Keep in mind that not all stories need to be long-form. charity: water’s Facebook content shows how you can tell stories in just a sentence or two, like in this post. I mentioned above that charity: water raised over $8 million through their online platform last year and $33 million in total. Guess how much they spent on marketing during that same year: just shy of $9k. While charity: water sometimes accepts donated advertising space, the majority of their marketing focuses on creating content that inspires and allows people to experience the work that the nonprofit does (and where their donations go) through beautiful design, images and video. Figure out what inspires your donors and then create a content marketing strategy around that. The Humane Society knows that their donors are inspired by animals, particularly those that have overcome great odds, so they create Facebook content that tells the stories of different animals´ tribulation and triumph. By partnering with major brands such as Toms, Nautica and American Express and celebrities such as Will and Jada Smith and Adrian Grenier, charity: water has been able to amplify its message and reach audiences they might not have reached otherwise. These brands and celebrities talk about the nonprofit in their social media channels, in videos, on their website and even promote it through their products; Toms has released limited-edition charity: water glasses and shoes. You don’t have to partner with A-list celebrities; instead, start by targeting influencers who are relevant to your cause, and make it your goal to convert the most important ones into ambassadors for your organization. You should also think about how you can partner with other like-minded organizations and companies––big or small––that can help you reach more people. For example, the niche ecommerce site AhaLife recently had a benefit lunch for Pencils of Promise. When Harrison founded charity: water he set out to create a great brand that revolved around storytelling with multimedia, inspiring people through highly-sharable content, connecting people to the impact of their donations and always using beautiful design. Since then, he and his team have strived for excellence in all the materials they produce. In fact, the second person Harrison hired was a designer. The nonprofit’s web design is pixel-perfect and its printed materials are stunning. I am always excited when I see the charity: water name in my inbox because I know the email will be a joy to look at and fun to read. 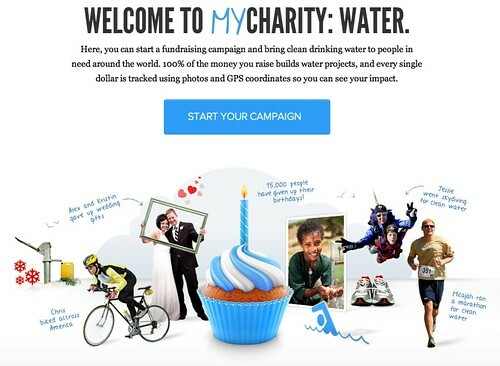 In short, charity: water is always on-brand, whether they are launching a landing page for a new campaign, publishing their annual report, sending an invite to their annual gala or partnering with Jambox to create charity: water-themed wireless speakers. Unfortunately design and branding are often on the very bottom of a nonprofit’s list of priorities, but charity: water understands that if it wants to appeal to a young, millennial donor base then they need to prioritize beautiful design. In fact, a “Design for Living” survey showed that Millennials place a large amount of importance on design when making purchasing decisions. What makes nonprofits think it would be any different when millennials decide which organization to donate to? As Victor Luckerson points out, nonprofits should keep in mind that as the baby boomer generation ages, appealing to millennials is a solid strategy for fostering long-term donor loyalty. So hold yourself and your team to high standards when publishing anything that will be seen by the public; if it´s not in line with your brand guidelines or up to par in terms of quality, tweak it until it’s just right. I could probably write a book about all the amazing things charity: water does with their marketing, but I know you have important stuff to do (like applying these nine lessons to your marketing strategy). So I’ll wrap it up by talking about copy. charity: water writes great copy. They make their headlines pop with eye-catching numbers and a dash of humor when appropriate; on the web they break paragraphs into short, easily-digestible chunks accompanied by photos or graphics; and they have big, beautiful buttons whose text often parts from what you typically see in CTAs. If you want to convert donors online and inspire people to align themselves with your cause, invest time in learning how to write great copy, or even hire an expert to do it for you. Start by defining a tone of voice that reflects the brand personality you want to convey, and then rewrite the headlines and body copy on the most important pages of your site following web copy best practices. And remember to stay positive; while it is okay (and probably necessary) to convey the severity or urgency of your cause, try to maintain an inspiring, positive tone that gets people excited about what your organization is doing. Joanna Wiebe’s Copy Hacker e-book series is great for learning how to write web copy. It’s tailored for businesses, but the lessons can easily be applied to nonprofits. Neil Patel has talked about the importance of creating cult-like connections with customers (think Apple). By approaching charity: water´s marketing strategy thinking more like a business than a traditional nonprofit, Harrison seems to have woven this idea into the foundations of his organization from the start. Through a commitment to storytelling, beautiful design, broadcasting a unique value proposition, putting donors at the center of their strategy and creating highly sharable content, charity: water has has built a brand that incites the kind of loyalty, excitement and inspiration most nonprofits (and companies, for that matter) dream of. Throughout the holiday season charity: water will be raising funds for their Cambodia campaign, which will help bring clean water to more than 15,000 homes in Cambodia. About the Author: Chloe Gray specializes in digital marketing strategies for startups and medium-size tech companies. She currently leads the marketing team at the Big Data company Ondore. Be sure to say hi to her on Twitter. You also can follow her on Facebook, Google+, and LinkedIn. 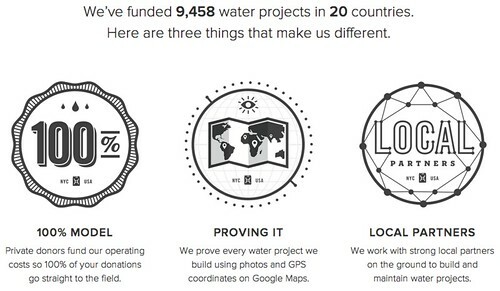 One thing I’m really proud of that charity: water is doing is embracing high quality design. I’m not suggesting that nonprofits need to blow their entire funding on a pretty website, but it makes them look serious and makes it really easy to get involved and donate. There are a lot of nonprofits out there that I wouldn’t easily say the same thing about. I think that nonprofits need to take advantage of their biggest asset, which is that they don’t have to pay for social proof. People want to help out where they can and get a good feeling from that. Unlike businesses, who have to go out their way to try and spread their word and try and get likes (see how many companies are listed at http://www.buyfacebooklikesreviews.com alone) nonprofits have an advantage in that people actually want to help them out. So nonprofits should be able to use the fact that they have an advantage in getting social proof to their advantage. The other thing that nonprofits need to do is make sure to point out how they’re actually making a difference in peoples lives. That’s a way to reach out to people emotionally and on a personal level that other types of businesses have no way of reaching. Thanks for another great post! While many people refer to charity: water as a great non-profit success story, especially in the marketing space, this is the most thorough and practical breakdown of what they’ve done and why it works that I’ve seen – any non-profit person could take this and apply it to their own organisation. And I love that you highlighted the “stay positive” aspect. I think this is one of the most important lessons non-profit marketers need to learn – positive messaging helps people to believe in a better future. Misery and scare tactics get quick little guilt-driven donations and cause people to bury their head in the sand. If we want to change the world (as opposed to simply keep our non-profit organisation in business) we need to be inspiring and empowering people! It is really interesting how they succeed in marketing strategy for a noble cause. There are many companies which works in a noble cause but they lack in their marketing skills. I guess NGO needs to market interesting content while spreading the message. Cambodian Rural Education Fund (CREF) provides supplies, equipment and education to children and families in a village near Battambang located in western Cambodia. We provide funding in education to support sustainable practices. There is no mandatory education in Cambodia and many children especially in rural areas (such as where our school Brighter Tomorrows is located) previously had no hope of attending school since they were needed to assist with the farming or caring for younger siblings. We are now engaging these children and families and promoting education as the key to success in life. Please consider making a donation today and help a child succeed in their education. *** All money sent to us is 100% used to help the students and teachers in Cambodia. We are registered as a non-profit organisation. It is indeed that non profit organisations need more efforts on an effective digital marketing strategy- Great read . Wonderful pointers. Love this, awesome strategy, and a truly inspirational piece. Charity: Water have certainly done a great job! I particularly like the ’100% Model’; some people underestimate how important it is that people know exactly what their donation has gone towards, but I believe it’s imperative to prove that their efforts are valued. To see tangible results of how my contribution has made an impact would make me 100% more likely to donate again in the future!